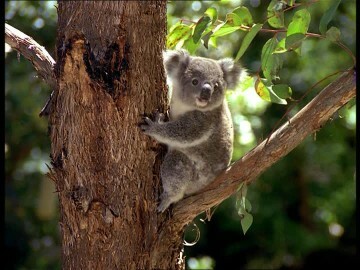 Koalas are the cutest animals that are located in Australia. Their body length is 60-85cm (24-33in) and it weighs 9-33 pounds. The leaves on the eucalypt woodland trees make up most of their diet. The koala is a stocky animal with a large head. The koala's ears have thick fur on both the inside and outside. It's curved sharp claws are well for climbing and hanging on trees. Young are called Joeys, they are fully weaned around a year old. They have fluffy ears and spooned-shaped nose. The Koalas closest relative are the wombats. Their color ranges from silver grey to chocolate brown. They are largely sedentary and sleep up to 20 hours a day and only 4 hours a day are spent in active movement. Koalas are located in the northern populations.